Ryan Zimmerman sat down at Spring Training to speak with WTOP about the upcoming 2018 season, both his and the team's 14th in the nation's capital. WASHINGTON — Ryan Zimmerman is synonymous with the Washington Nationals. He has worn the Curly W every year the team has been in the nation’s capital, both he and the team making their debuts in 2005. 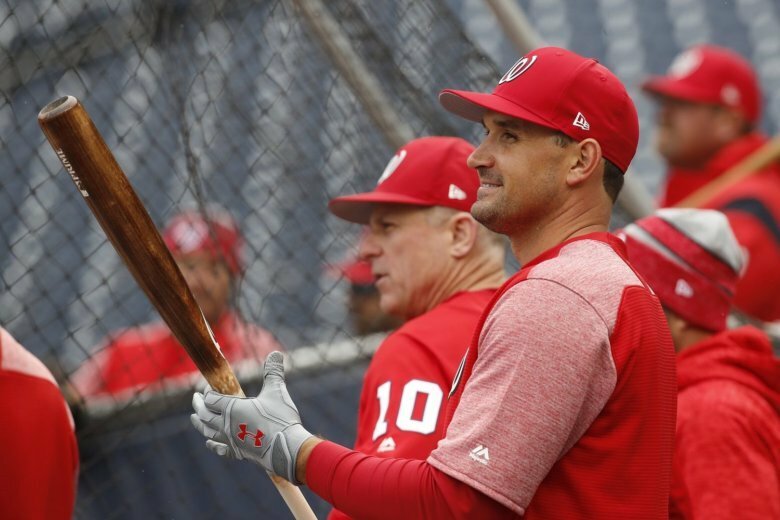 With Dave Martinez in 2018, Zimmerman is now playing for his seventh manager and looking to build off a career year, just a season after he struggled through his worst. In 2017, Zimmerman batted .303 with 36 homers and 108 RBI after hitting just .218 with 15 homers and 46 RBI the year prior. WTOP caught up with the face of the Nationals franchise at Spring Training in West Palm Beach to discuss the upcoming season, his new manager, and his comeback year. Jonathan Warner, WTOP: When we talked last year, you were very confident about rebounding in 2017. It’s something that you have to believe in obviously, and it paid off. Did you approach last year differently than you did before? Ryan Zimmerman: I don’t think I approached it any differently. All of us are always confident. As soon as you doubt yourself, you might as well just head home. But I think just knowing that I was healthy and having a healthy offseason without any rehab or anything like that was just huge for me. When did you feel that the year was maybe going to be different for you? Did you realize early on? I don’t know if I ever realized it. Once you get into the season and you get off to a good start or find something that works, honestly, you don’t think about it too much. You try not to think about it. You just keep doing the same stuff each day and get into your routine and try not to lose that feeling for as long as you can. You said once that you need 30 at-bats in Spring Training to be ready for the season. Is that the same number for you? Yeah, it’s not much. It’s probably 50-ish. There have been times I’ve hit .400 down here and there have been times I’ve hit .200. Once that first game starts, it doesn’t matter what you did down here. If you’ve been around long enough, you know what you need to do to get ready. Once you get into the season you know what you have to do to be successful, then it’s all about executing and staying healthy. Second straight offseason you’ve been healthy, right? Yeah, no injuries going into the offseason — no surgeries, no rehab. So, it’s nice to come here and just worry about whatever you need to do to get ready to play baseball, and not have to really take care of your body as much. Watching you play first base, I think of you now as a first baseman. Does it seem so long ago that you played third base? It’s been fun for me. I think the first year was definitely hard and a big learning curve. Each year it’s gotten easier and felt more comfortable over there. But I really do enjoy the position. You’re involved in a lot of plays. Being on the other side helped me realize how important it is to have a good first baseman and someone who works hard defensively over there. So that’s been my goal, to make those guys feel comfortable that they can try and do whatever they want and know that I’m going to save them as much as I can. You have a new hitting coach in Kevin Long. Has he given you any good ideas? All of us in the big leagues do our own thing. We know how to hit. The hitting coach, they’re kind of there to soak it up and give us some pointers here and there. But he’s positive. He has energy every day, ready to work. To me, that’s the biggest thing — being positive. And even when I don’t feel I can get hits, he can somehow make me feel like I can get hits, and K-Long has no problem doing that. Your impressions of new manager Dave Martinez? Being under Joe (Maddon) for so long, everyone assumed that he’s going to be like Joe. I think there are certain similarities, but I think Davey is his own person as well. He lets everyone be themselves and have fun and do whatever they need to have the best chance of having success, and once you get on the field, just play hard. Do what you’re supposed to do as a professional on the field, and if you do that, he’s not going to have any problems with you. You’ve seen every manager in Nationals history. Is there a different vibe with Dave Martinez? Yeah, it is a different vibe. There’s kind of a new energy. This is kind of the first real new-age manager with all the new analytics and influx of youth, so it does feel different. And honestly, it’s a good thing. I wouldn’t say anything was wrong with how things were. I think Dusty (Baker) did a great job and obviously the team was crazy successful winning 95 and 97 games. But it’s something new and different and I think it’s good for us. Even with all the injuries, the Nationals still won 97 games last year. Can you imagine if you stayed healthy this year what you guys could do? Yeah, that’s the name of the game is to try and stay healthy. If you look at the teams that make the playoffs, you look at the teams that go deep in the playoffs, it is usually all about health. We do a really good job about having depth. Our bench was unbelievable last year. A lot of those guys had to step in for extended periods of time and we didn’t really miss a beat. So a lot of credit goes to them. During the season, there’s going to be injuries. People are going to miss time, that’s just how it is in this game. You have to have guys that are ready to step in and fill that space till they get back, but if we can stay healthy, we have just as good a chance as anyone else and that’s really all you can ask for. Last year, the team lost Adam Eaton in April, Trea Turner was sidelined for two months and Bryce Harper was out for a month. You usually bat fourth. Can you imagine those guys ahead of you on an everyday basis? (Laughs) Honestly, I don’t know if I’ll bat fourth this year, we have too many good players. You saw in April, with Adam and Trea at the top and just the amount of pressure that they put on the other team right from the beginning. And then there are four or five of us that I think are very good at driving in runs and know how to hit. The biggest thing is there just isn’t a break. We’re all good hitters, but we also don’t really swing at balls. We don’t make it easy to get outs. We take a lot of pride in that and hopefully we can continue to do that this year.